Once resources are defined and assigned to activities, the histogram and curves (i.e. resource profile) will be displayed on the canvas. From the menu bar, click Tools > Manage Resources… from the resource section of the dropdown menu. The Project Resources window opens. To control which resources are being displayed, check or uncheck the box under the plot column next to the desired resource. NOTE: By default, all resources will be displayed unless the plot is turned off during definition of that resource. Individual activities can be removed from the resource profile by selecting them on the canvas and then clicking Objects > Set Properties for Selected Objects. In the Set Global Properties window, under the Displays section, click twice to uncheck the box next to Resource Profile. When finished, click OK. The selected activities will be removed from both the histogram and cumulative curve calculations. To hide the histograms and curves on the canvas, click the Resource Display Mode icon in the toolbar. To adjust how the histogram is calculated, how to display the plots, or which plots to display, the resource display settings may be modified. Click Tools > Modify Resource Display Settings… from the menu bar. The Resource Display Settings window opens with a number of fields. This field determines the period over which the histogram is distributed. To change it, click the down arrow button to display a dropdown menu. The histogram may be calculated based on Daily, Weekly, Monthly, Quarterly or Yearly totals. If PolyTime is enabled, the histogram may only be calculated based on the schedule time unit or above. For example, if the schedule time unit is set to months, then only Monthly, Quarterly or Yearly totals are available. The histogram will display the resource usage based on the time unit selected. The resource profile can be anchored to the bottom of the canvas or slide automatically as the canvas scrolls. If Auto-Scroll is selected, then the resource profile is always visible. Scrolling to any specific vertical point on the chart keeps the display of resources constant. If Fixed at the bottom is selected, then the resource profile always anchors at the bottom of the chart, which might not be seen in the current displayed page but can be seen by scrolling to the bottom of the chart. This option will cause the screen display of resources to exactly match with the printed schedule. The resource profile can cover as much of the vertical height of the window as desired, with 1 being the maximum. If this box is checked and resource limits have been applied, then any resource which is being consumed over its allowable maximum will be displayed at the cursor when hovering over the histogram on the canvas. There are four available plots: the Histogram plot, the Baseline plot, the Early Dates plot, and the Late Dates plot. 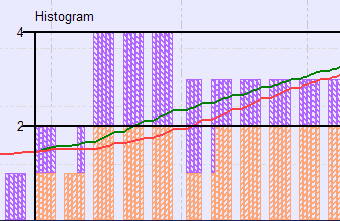 Click the checkbox under the plot column to display the corresponding graph on the canvas. NOTE: By default, all graphs are plotted unless turned off. The Histogram plot displays as a color-coded bar chart. The Baseline curve displays as a green (cumulative) resource curve. The Early Dates curve displays as a blue (cumulative) resource curve. The Late Dates curve displays as a red (cumulative) resource curve. Histograms represent the daily consumption of resources (or weekly, monthly, etc. as long as it’s greater than the schedule’s time unit) for each activity. Baseline represents the total cumulative consumption of resources for every activity. Baseline can be calculated as RESn = RESn-1 + Ri, where “n” denotes every day between the planned dates for activity “I” and Ri denotes the resource daily-rate for activity “I”. Early Dates represents what the total cumulative consumption of resources would look like if all activities were on their early-dates. Late Dates represents what the total cumulative consumption of resources would look like if all activities were on their late-dates. Each plot has it’s own plot ruler. 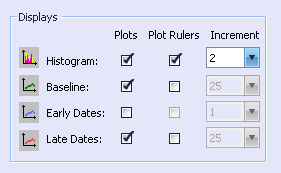 The plot rulers correspond with the list of plots to the left. They may only be displayed if their corresponding plot is displayed. 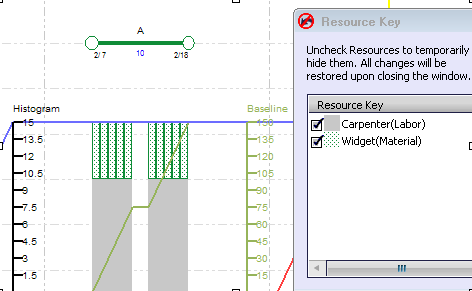 To display a desired ruler, check the corresponding checkbox. When checked, the increment of the ruler can also be adjusted. To adjust the increment of the plot ruler, enter the increment value desired in the field. This value refers to the amount of resources between each horizontal line. For example, with an increment of 50, every line represents an additional 50 resources. If the increment were 25, there would be twice as many ruler lines, with the difference between each line being only 25. When measuring consumption for individual resources, make sure only that resource is displayed in the resource profile. For example, to measure the cost for a particular schedule, all resource except for Budget would be turned off. This is most easily done by opening the resource key. 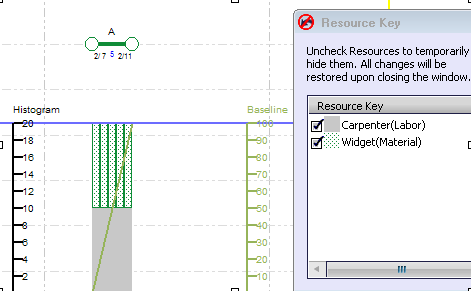 To view the resource key for resources being displayed, choose View > Resource Key…. The Resource Key window opens, displaying all resources currently on screen. To temporarily display or hide a resource’s histogram, uncheck the box to the left of the resource name. 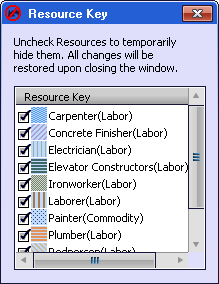 Any displayed resources hidden through the resource key only remain hidden until the Resource Key window is closed. At that point, all previously hidden resources will display as set in Tools > Manage Resources…. In the following example, Activity A requires 15 units each day of a combination of resources: about 10 of those are carpenters and about 5 of those are widgets. We know this by measuring the height at which each resource coincides with the histogram plot ruler. This is what the histogram does: it makes it quick and easy to see graphically which resources have been assigned to which activities and how much are required each day. In this example, the Activity’s duration has been changed from 10 days to 5 days. Note that it still requires 10 carpenters per day even after the duration has changed, which means that it must have been assigned 10 carpenters per day. The amount of widgets, however, has increased from 5 to 10, which means that Activity A must have been assigned 50 widgets per duration. The resource curves show the total cumulative consumption of resources for every activity. For Activity A, the total consumption is derived by multiplying the histogram (i.e. daily consumption) by the total duration of Activity A. From example 1 to example 2, you can see that the total consumption drops from 150 to 100 as the duration decreases. Add the total consumption for every activity together and the result is the baseline curve, colored green. The early-dates curve, colored blue, shows what the total consumption would look like if every activity were on its early-dates. The late-dates curve, colored red, shows what the total consumption would look like if every activity were on its late dates.